Tanjore paintings are among the most distinct forms of religious art that originated from the town of Tanjavoor, the capital city during the reign of the Cholas. 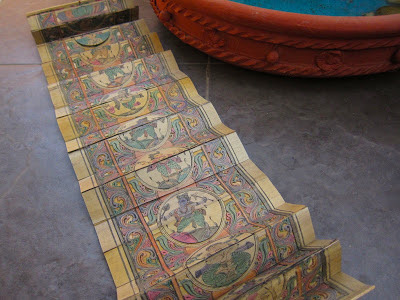 The paintings are created with an elaborate process that includes a drawing, adornments using precious and/or semi-precious stones and raised profiles made of a special molding material. 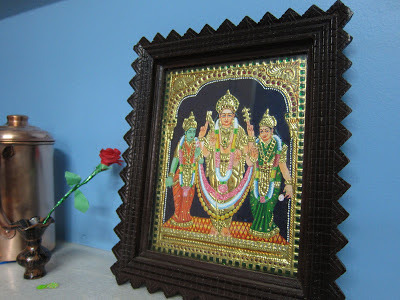 Parts of the painting are then covered in 24-carat gold foil making the figures of gods and goddesses glitter when they catch the light. 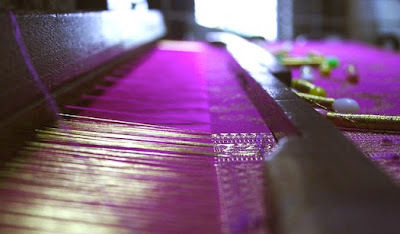 Another unique tradition that has existed here is that of crafting exquisite silk sarees. Weavers from the town of Kanchipuram have been creating visions in silk since several hundred years. 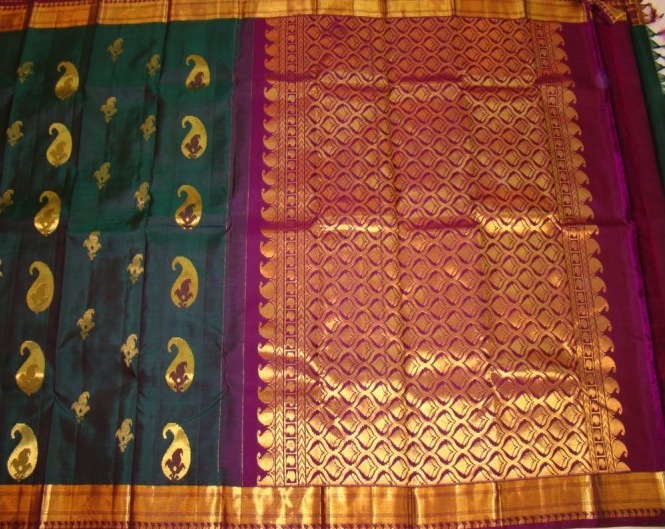 Sarees that originate from his town are still in great demand by traditional minded fashionistas across the country. 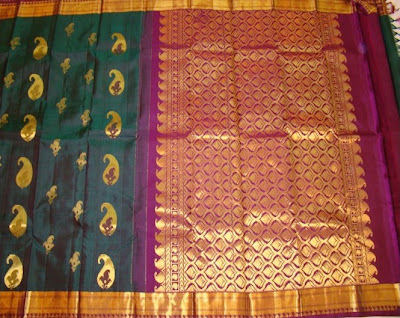 Kanchipuram sarees used to be woven in silk and gold thread; now the gold is being replaced with a lighter variety in most cases, but you can still source the original stuff if you are willing to spend a princely sum on these labours of love. 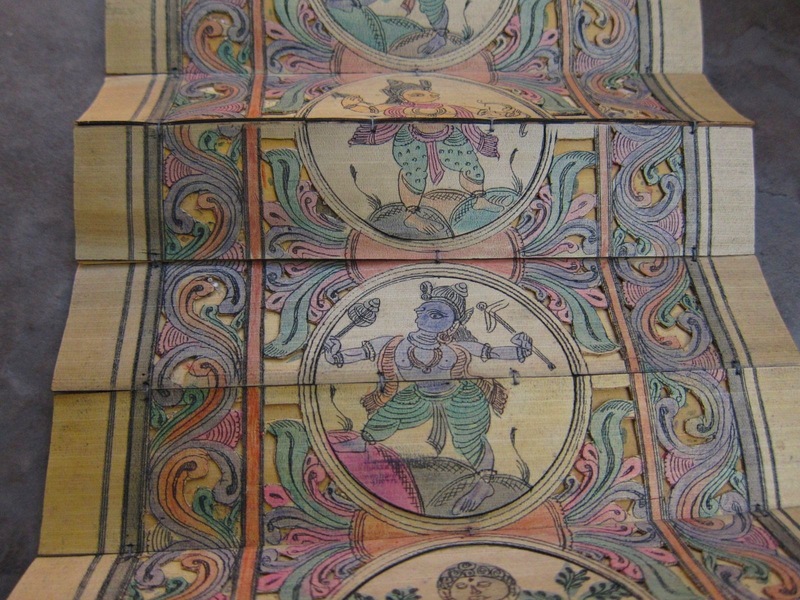 Finally, we ran into some fascinating samples of palm leaf painting from Orissa in an art fair. Palm leaves used to be the medium in which ancient Indian religious texts used to be rendered for a long time. 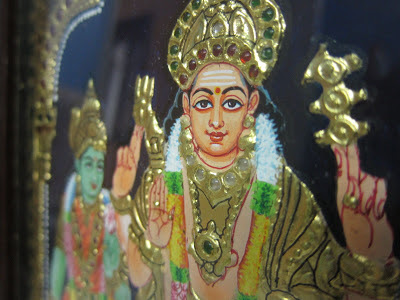 I remember our old temple priest pulling out palm leaf manuscripts delicately strung together with red threads and read out sacred chants for special occasions. Orissa has had a tradition of creating elaborate paintings from Indian mythology on palm leaves. These leaves are dried used a special process. Drawings are made by etching on the leaves using a sharp knife and then rubbing off dyes quickly on the newly etched lines. 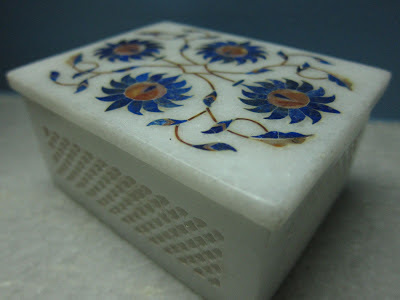 During our trip to Agra a few years back, we had a chance to see some of the finest artisans do their magic on blocks of marble. Such exquisite workmanship continues to exist today but is fast depleting. 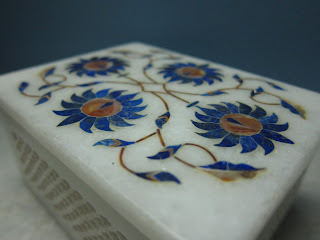 I still caress the fineness of the marble inlay work of the pieces I brought back with me from there. 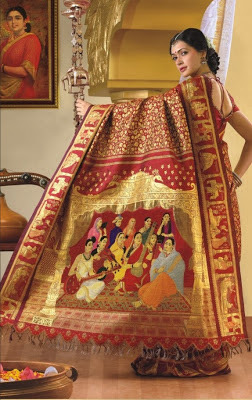 I hope these traditions do not completely disappear during our lifetime. @Renuka: Thanks for visiting. Glad you liked it. 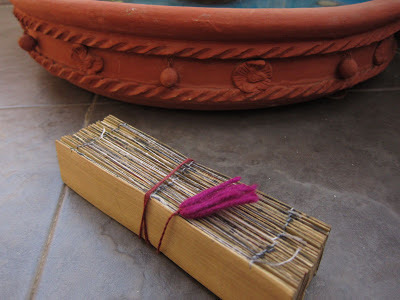 This is the word which came out when i saw the blog.Pics are amazing .